A day after reports linked Apple to a massive cloud services deal with Google Cloud Platform, sources have come forward with information of a comprehensive in-house data center initiative dubbed "Project McQueen." 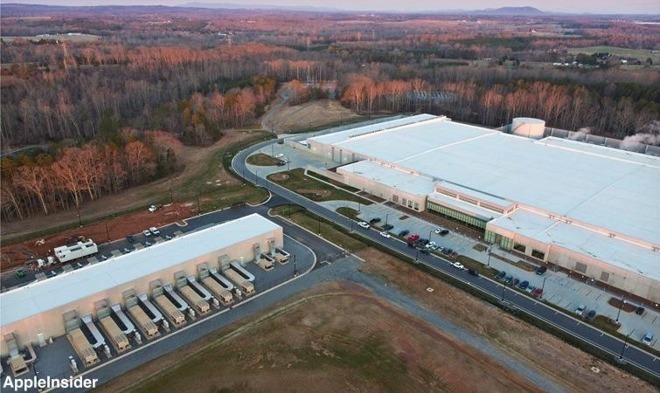 Apple's data center in Maiden, NC. With Project McQueen, Apple is looking to wean off third-party cloud providers like Amazon Web Services and Microsoft in favor of its own infrastructure, an investment expected to pay for itself within three years of going live, a person familiar with the company's plans told VentureBeat. Apple currently relies on AWS and Microsoft's Azure for its content serving needs, including data-intensive products like iTunes and iCloud. The massive user base of iTunes and its various music, video and app storefronts is well known, and in February Apple revealed it services more than 782 million active iCloud accounts worldwide. Sources said, however, that the iPhone maker is not pleased with Amazon's performance, specifically the inability to quickly expedite photo and video requests from iOS devices. In addition, Apple wants to bring iTunes under one roof. Currently, third-party services handle a majority of iTunes' data needs, with Azure being the primary provider, sources said. Interestingly, the idea behind Project McQueen was purportedly formulated after a conversation with a Microsoft employee, who told an Apple employee that Azure would be unable to keep up with Apple's continued growth. To cope with the overflow, Apple would likely have to invest in an expansion to Azure's data center network, the Microsoft employee reportedly said at the time. Instead of sinking capital into infrastructure owned and operated by outside firms, Apple is now mulling a buildout of its own. To that end, the company has purchased plots of land in China and Hong Kong for future data centers, the report said. Aside from the financial benefits, Apple would be able to optimize its data centers to suit customer needs, resulting in an improved user experience. It is unclear when Apple plans to announce or break ground on the supposed data centers. Reports yesterday claimed the company struck a multi-year deal with Google Cloud Platform worth between $400 and $600 million, though the partnership could prove a stopgap until Project McQueen goes online.